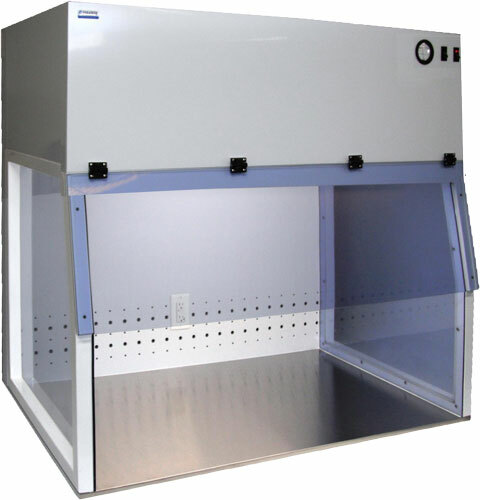 Portable polypropylene laminar flow Hoods provide a space-saving design that can be positioned on nearly any bench. 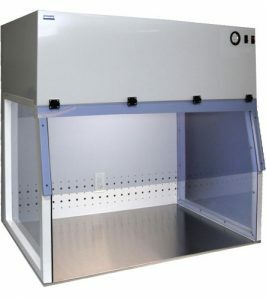 Optional work surfaces available to meet any cleanliness requirement.These vertical laminar flow Hoods are ideal for applications which are not hazardous to the operator but require a clean work area. Consists of a Certified Fan Filter module. Meets IEST recommended practices. low sound, low watts Measuring only 50 dBA. Running at only 240 watts @ 90 fpm 490 CFM @ 250 Watts. Minihelic gauge (0 – 3” Water Column) monitors pressure differential when it exceeds the limit, it indicates the need to replace the HEPA filter(s). Back Plenum provides air recirculation reduces the percentage of dirty air passed through the filter, overall filter life is extended. 70% of the air from each cycle is recirculated through the supply HEPA filter while the remaining air is discharged from the hood through the exhaust HEPA filter. Laminar Flow Hoods generate a continuous flow of class 100 HEPA air. 70% of air flow may recirculate back through the filters, causing an extended filter lifetime. Consisting of a Certified Fan Filter module meets IEST recommended practices. low sound, low watts Measuring only 50 dBA. Running at only 240 watts @ 90 fpm 490 CFM @ 250 Watts. Back Plenum provides air recirculation, which reduces the percentage of dirty air passed through the filter, thus extending the overall filter lifetime. Fan Motor: Direct drive, forward curve, centrifugal-type with sealed bearings; rated for continuous duty; furnished with overload protection and a two-speed switch. Performance: Particle count exceeds Class 100 requirements.